Sink related leaks are often small and go unnoticed until significant damage is finally discovered. Such a leak will continue to collect under the Sink and then seep between the flooring and sub-flooring. The damage often goes undetected until the floor is visually damp or the smell of mildew is present, at which time the damage and cost to replace is extensive. 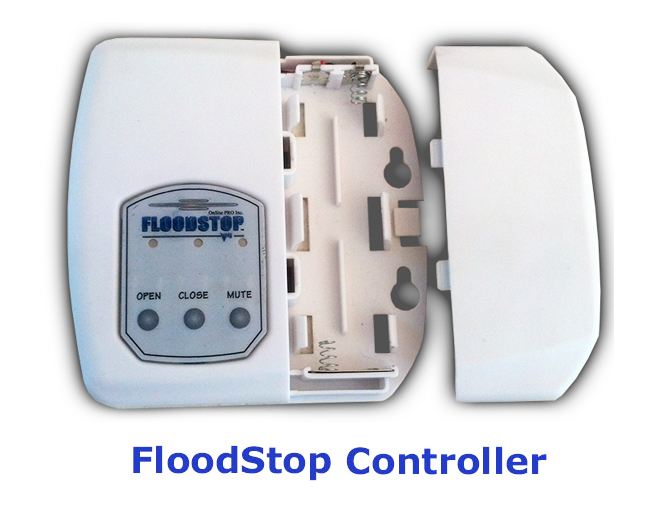 FloodStop (FS 3/8-CD) automatically shuts off the water supply to the Sink, whether caused by a ruptured supply line, leaking garbage disposal or an overflow. Powered by AC/DC Adaptor/Transformer or Batteries. Output contact available, which allows the Controller to connect with Alarm, Home Automation or Auto-Dialer systems if desired. Easily installed in ten minutes. Water loss from unexpected appliance failures and hose ruptures are detected by FloodStop's water/leak sensor, and the water supply is automatically and immediately shut off.